Almost tropical weather greeted the entrants for the latest round of the European F2 Championship, the Grand Prix de Rouen. As usual, only 20 cars would be permitted to line up for the race, so there would have to be 10 disappointed drivers missing out for Sunday. One who definitely not be in that category was Alex Ribeiro. The Brazilian was the main talking point of the practice days. Despite having never even been to Rouen before, he was fastest on both days in his Caixa-sponsored March-BMW and deservedly secured pole for the race. The cars were split into odd and even numbers to make up two groups of qualifiers for the two days. Rene Arnoux set the early pace in his Martini-Renault, leading the odd-numbered cars with a 1m 48.1s time. However, Ribeiro then made that time look positively slow with a blistering 1m 47.41s time, 0.6s quicker than anyone else could manage. He managed to slice a further 0.22s off his time on day two, but by then the others had caught up, end he needed that extra speed to hold of Patrick Tambay’s Martini-Renault and claim pole. Tambay had problems on day 1, but everything was fine for day 2 and his speed reflected that. Indeed, with a little more luck he may have grabbed pole, but his engine began to struggle late in the session so he wasn’t able to try for one more banzai lap. Team-mate Arnoux was close behind in third. In 5th, sprained arm and all, was Ribeiro’s team-mate Maurizio Flammini. The Italian had to be lifted from his car having expended all his energy to go that fast, and he was pleased with how things went under the circumstances. Beside Flammini on the third row was previous year’s winner Michel Leclerc in his Elf-Renault. Leclerc may have qualified better if his brakes hadn’t failed on his very first lap of the weekend and caused a collision with a fence post, thus curtailing his practice time severely. His team managed to fix the damage for day 2, and he did well with the limited time he had available. He may even have qualified higher up, but his car started to run dry of petrol on his last flying lap. Leclerc reckoned it cost him around half a second, and he had to settle for a time in the 47s bracket and 6th. A surprise 7th went to Hans Binder. The German was drafted into the Opert Chevron team at the last minute, and he quietly went about his business, managing a creditable 1m 48.52s in his B35. 8th was Jean-Pierre Jabouille, who had had myriad problems with his Elf-Renault, but was hoping for better on race day. Giancarlo Martini qualified 9th in his March-BMW despite some very untidy laps and the odd spin, while Ingo Hoffmann rounded out the top 10 in a similar car. Keke Rosberg was next, the young Finn unhappy with the twitchyness of his Toj-BMW but determined to do well. Giorgio Francia thankfully had no repeats of his terrifying practice accident from 1975, and his Chevron-BMW qualified 12th. American Eddie Cheever was next in the Project Four March, with Roberto Marazzi alongside him, then came José Dolhem in the third Opert Chevron, Freddy Kottulinsky in a new Ralt RT1, Ray Mallock in a Ford-powered example, Willy Deutsch in a March-BMW, Lorenzo Noccolini in another March-BMW and finally Alberto Colombo who scraped into 20th in his March. Those who missed out were in order of times, “Gianfranco”, Richard Roberts, John Nicholson, Bobby Muir, former winner Jean-Pierre Jaussaud, Xavier Lapeyre, Bill Gubelmann, Mikko Kozarowitsky, Bernard de Dryver and Remi Gilles. Jaussaud was the biggest surprise, but he had his practice completely compromised by a constant misfire, which could not be cured. It wasn’t until after practice that the problem was found: a fractured spark plug lead. There was much consternation in the Martini pit after the morning warm up. The mechanics had tried to sort out engine cooling problems by changing the front bodywork to allow for better airflow, and they installed new Renault V6s in each car. But just a few minutes after they fired them up, they both expired, causing panic. Both cars would have to battle on with older engines for the race: Arnoux with his practice engine and Tambay with the spare. By the 3pm race start time the temperature was oven-like, and many were worried about how their engines would survive in such extreme heat. Ribeiro got away best from the start, followed by Tambay and Arnoux, but Arnoux was soon past his team-mateand onto the tail of the Brazilian. Both then began to pull away from the rest at a rapid rate. Tambay was next ahead of Jabouille and Flammini, but the Italian muscled his way past both and set off after the front two. Pryce was in 6th, while Leclerc was briefly 7th until a driveshaft failed midway through his second lap. After four laps Ribeiro and Arnoux were still at it hammer and tongs, but both cars appeared to be misfiring as the screamed around. 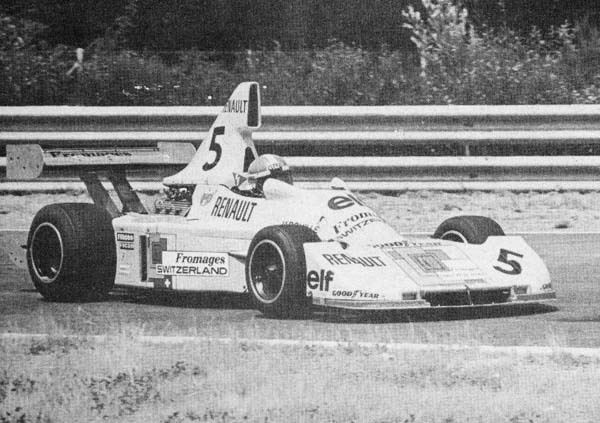 By lap 5, Ribeiro’s excellent weekend was over, his engine cutting out completely and causing him to coast to a stop, leaving Arnoux in front, although his misfire didn’t seem to be clearing either. Meanwhile Pryce and Cheever had exited proceedings. Pryce had had problems with his engine struggling for power in the slow corners, and so he was compensating by changing from 1st to 2nd gear halfway through the corner. He was caught out by a slide which he could not correct properly as he had his hand on the gearstick, and he collided with the fence. Cheever’s car drained itself of all its water when the radiator broke, and expired mightily on lap 6. Back at the front, Flammini was slowly closing on Arnoux’s misfiring Martini, with Tambay and Jabouille not much further back. 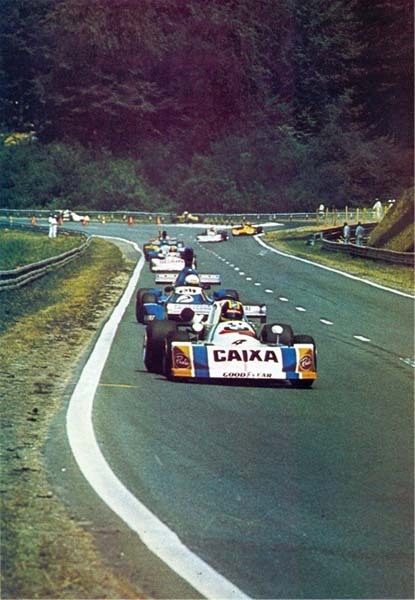 The came Martini, Francia, Rosberg, Marazzi, Kottulinsky, Binder, Hoffmann and Dolhem. By the end of lap 10, Arnoux’s misfire was obviously getting worse, and Flammini was right with him, by the following lap he was forced to pit. The Martini mechanics descended on the stricken car, and after quickly deducing that it was the spark box causing the problem, they replaced it with alacrity, put two new front tyres on the car, and sent him back into the fray, albeit now a lap down. This left Flammini with a 3-second lead at the front, but Tambay now saw his chance and closed right up on the Italian. But just when it appeared he would be able to get by, his engine suddenly dropped onto five cylinders, and the Championship leader was forced out. 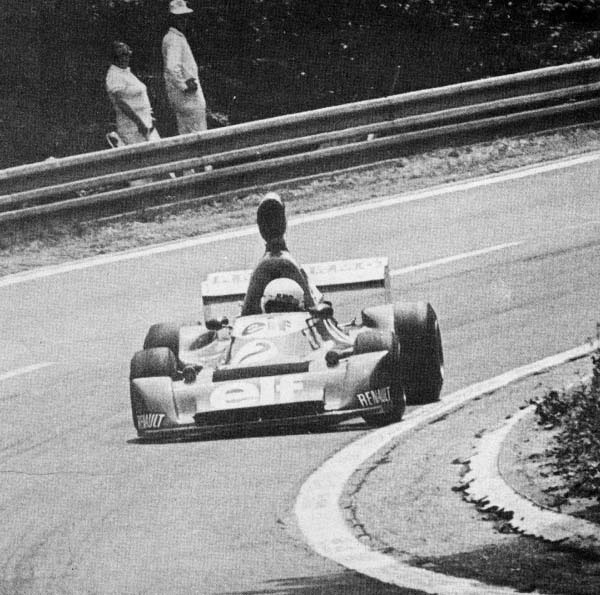 This elevated Jabouille to second and took the heat of Flammini for a bit. Martini was now third, ahead of a charging Rosberg, who had got ahead of Francia. Colombo’s engine meanwhile called it a day on lap 20, and Mallock retired with the same problem soon afterwards. 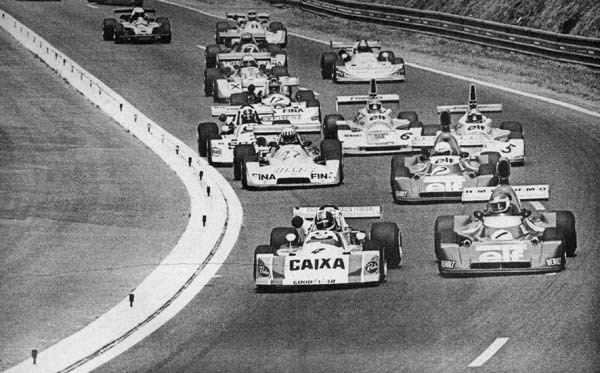 Arnoux was now charging back up the field, and he became the centre of attention as the rest of the field began to spread out a bit. He quickly caught those ahead of him and began passing them like they were standing still. Flammini now began to increase his lead, Jabouille unable to keep up as his fire extinguisher had worked itself loose and he was holding it in place with one hand just in case it came right away under heavy cornering! Martini was in a lonely third, the challenge of Rosberg having faded after the Finn suffered a broken seat-mounting, which meant he couldn’t reach the pedals properly. Rosberg elected to slow it down to avoid a big shunt, doing enough to maintain his 4th spot but no more. Francia was falling back into the clutches of Marazzi due to cramp in his right leg and a blistered hand, but Arnoux was the flying, blasting past both of them on the same lap and heading off at unabated speed after Rosberg. On lap 25 he shattered Jaussaud’s lap record, and with each lap was setting faster and faster times. He got past Rosberg and Martini, and was closing on Jabouille by 3 sconds a lap when the flag fell. While he only finished 10th, Arnoux’s drive was undoubtedly the highlight of the race, and was made even more so when it was found his rear tyre had been slowly going down over the last 20 laps! Flammini, comfortably in front, was able to take it easy over the closing laps, as Jabouille accepted his second spot and Martini settled for third. Rosberg duly came home 4th, while Marazzi crossed the line 5th after surviving a late blast from Kottulinsky, who had closed right up on him before suffering ignition failure just 8 laps from the finish. Francia battled on but was set upon by Hoffmann and the Brazilian exploited Francia’s problems to grab 6th just before the flag. While Hoffmann might have expected to finish higher than he did, being an F1 driver and all, he battled many problems, including the engine dying on the first lap, third gear jumping out, high oil temperature and a broken water gauge so he did well to grab a point. It was an excellent win for Flammini then, the Italian battling the high temperatures and the pain of his sprained arm to take a well-deserved win. The star of the show however, had really been Arnoux. His incredible never-say-die drive from last thrilled everyone, and the French crowd went home happy, despite there not being a local win.